2) Complete sweepstakes registration form by clicking on "Sweepstakes" in the left column at www.facebook.com/leitersburgcinemas. 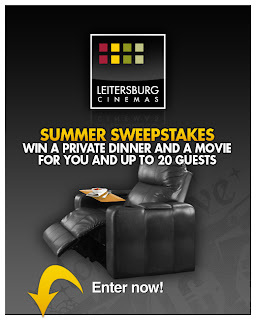 The Leitersburg Cinemas LLC Summer Sweepstakes giveaway entry process will end at 11:59 PM on Sunday, August 14th. No entries will be accepted after this time. 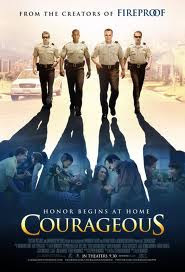 Employees of Leitersburg Cinemas LLC or High Rock Studios, their immediate family, and any other persons who reside at their home or residence are not eligible for entry. Furthermore any and all applications from these individuals will be deemed void among entry. The giveaway consists of one (1) grand prize. The grand prize consists of a "Private Dinner and a Movie for up to (20) people". Movie selection limited to available movies showing at Leitersburg Cinemas at the time of Dinner and a Movie date selected. Dinner and a Movie event is limited to a Monday, Tuesday, Wednesday or Thursday. Date must be selected in August, September or October of 2011 and subject to approval by Leitersburg Cinemas. Rules and regulations are subject to change. Changes to rules and regulations will be posted promptly on the News and Events page of www.leitersburgcinemas.com under the post “Summer Facebook Sweepstakes". Leitersburg Cinemas invites you to join us for a FREE movie. Movies start at 10:00 AM (box office opens at 9:30 AM). Movie titles, dates and times are subject to change. Tickets are offered on a first-come, first-served basis. Capacity is limited. date and time each week. 2) Complete sweepstakes registration form at www.facebook.com/leitersburgcinemas. 1) Complete an entry form on-location with the purchase of a movie ticket on Friday, May 20th, Saturday, May 21st or Sunday, May 22nd. Limit one entry per person per movie ticket. 2) Turn the completed entry form into the Leitersburg Cinemas LLC snack bar on the date of purchase. 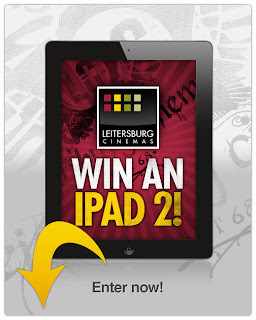 The Leitersburg Cinemas LLC iPad giveaway entry process will end at 11 PM on Sunday, May 22nd. No entries will be accepted after this time. The giveaway consists of one (1) grand prize. The grand prize consists of one (1) Apple iPad2. A $499 value. Entries will consist of on-location registrations and online registrations through the iPad2 Facebook Sweepstakes application. Rules and regulations are subject to change. Changes to rules and regulations will be posted promptly on the News and Events page of www.leitersburgcinemas.com under the post “iPad2 Facebook Sweepstakes". Please Note: the original event, including pizza, music, etc., has been canceled and changed per below. of the movie "Soul Surfer". In addition to all the great first-run movies playing at Leitersburg Cinemas in March, we've added (3) FREE Movies to the lineup for Friday, March 11th, Saturday, March 12th and Sunday, March 13th. These are all recent movies from 2010, so if you didn't get a chance to catch them yet, or just wanna get out of the house to watch a movie on the big screen, join us at Leitersburg Cinemas. It's our way of ushering in Spring and Summer. FREE MOVIE featuring "The Karate Kid" from 2010. Visit www.leitersburgcinemas.com for showtime. FREE MOVIE featuring "Toy Story 3" from 2010. Visit www.leitersburgcinemas.com for showtime. FREE MOVIE featuring "Despicable Me" from 2010. Visit www.leitersburgcinemas.com for showtime. For group sales information, email groups@leitersburgcinemas.com. 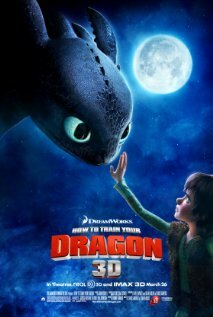 School is out on President's Day, Monday, February 21st, so join us for a great Kid's Movie, "How To Train Your Dragon". Showtime is 12:45 PM. 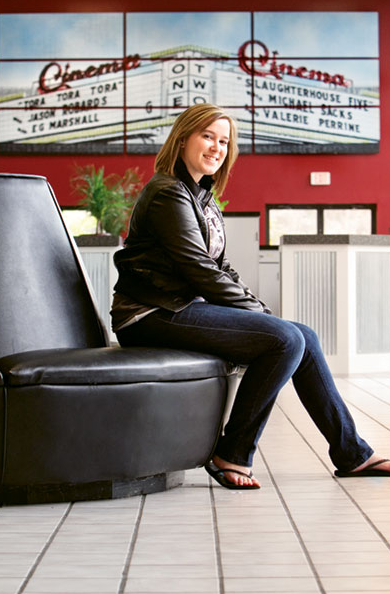 Here you will find great deals from Leitersburg Cinemas - serving Hagerstown, Smithsburg, Waynesboro, Greencastle and Chambersburg. Hope to see you soon! Here you will find the latest calendar events for Leitersburg Cinemas - serving Hagerstown, Smithsburg, Waynesboro, Greencastle, Chambersburg and. Hope to see you soon! We are pleased to announce our special Valentine's Dinner and a Movie events! Chicken Marsala - Boneless breast of chicken tossed in panko bread crumbs, topped with a variety of mushrooms in a wine sauce. Pasta Primavera - Penne pasta tossed with carrots, zucchini, squash, red peppers and onion. Coasted lightly in alfredo sauce.